Valentine’s Day is typically a time for romance between lovers, but the prime minister had different ideas. 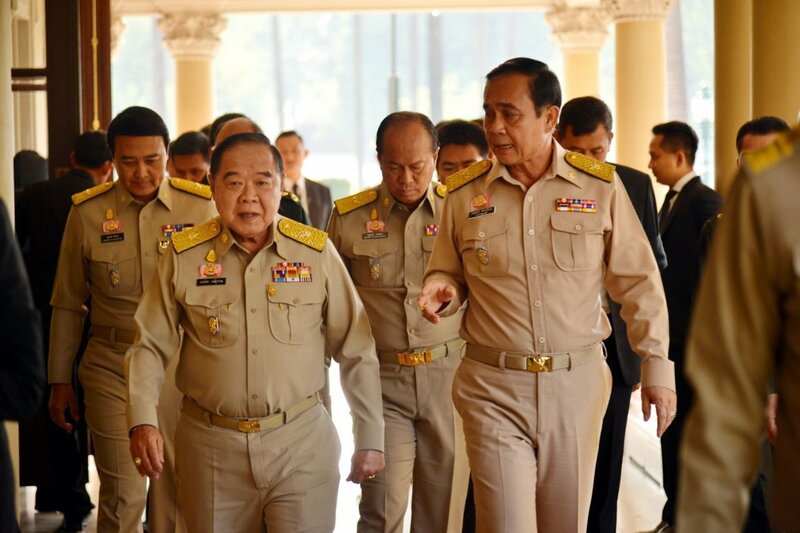 Prayut chose to release a new pop single, ‘Diamond Heart’, a song ostensibly about how two lovers must remain steadfast together despite the challenges they face. “Make your heart a real diamond, unrelenting/Side by side today together, obstacles mean nothing/The lessons we learn are new everyday/We have to build our hearts’ dream together so it’s resilient”, an army officer sings. Cheesy words to say to your loved one, perhaps, but when interpreted as a metaphor for Prayut’s relationship with the Thai people, not so much. Corruption scandals. Low marks for economic performance. Political protests. The first two months of 2018 has not been kind to the military government. Since coming to power, the Prayut administration has never seemed so besieged. And as a reflection of this relationship, the responses to his song were cynical. “Instead of a diamond heart, why not write a song about diamond rings and watches borrowed from friends?”, asked some on social media. Others noted that new songs from the prime minister aren’t needed, but new elections are. I want to say that I’ve long been supportive of Prayut. Was the 2014 military coup necessary, given the political situation? Yes. Was it important for the government to maintain control while a new constitution was drafted and the royal succession seen through? Indeed it was. Has the government accomplished some successful policy objectives? I would agree. But does it have a rationale for continuing to be in power? It does not. And it seemed that the government realised that its time was up and accordingly announced an election would happen in November this year; sure, there were some issues with its timeline for lifting the ban on political activity, but at the very least Prayut seemed to be ready to return democracy to Thailand. That changed when it was announced that elections would once again be delayed; there is now only a vague promise that a new election date would be set in June. Immediately, this sparked protests in Bangkok, a visible sign of frustration. They alone are not dangerous, for any protests would be limited and only a few would participate. But when combined with other signs of frustration, it is clear that the Prayut government is not sustainable. What are the sources of frustration? There are many, but there is no example better than corruption. Prawit’s luxury watch scandal has entirely discredited the government. His 25 (yes, 25!) watches are now a symbol of the corruption and hypocrisy of the regime and a display of how the generals have failed entirely in their self-imposed quest to wipe out corruption from Thai politics; they also personally damaging to Prayut, who has failed to sack his ‘big brother’. The subsequent scandal involving Education Minister Teerakiat Jareonsettasin has only weakned the government further. As Professor Thitinan Pongsudhirak wrote in the Bangkok Post, “the Prayut government is now morally bankrupt”. Prayut could perhaps right this wrong by taking belated action regarding his deputy, but clearly he does not have the personal will to do so. So how can the government remain in power? Simply put: it is difficult. It is not only unpopular, but also unneeded. There is simply no reasoning that the government can use to rationalise continued military rule. Security fears are bogus. By the end of 2018, Prayut will have been in power longer than most elected prime ministers, and voters become weary of even once-popular elected premiers. The prime minister has served the country well, but he has to hear the music: it is the time for the curtain call on his unelected government. If Prayut is wary of giving up power, then he must also know that it is perfectly possible for him to return to power after the election. Many would be happy for him to be prime minister again, if he were to win a democratic election, if it truly were the will of the Thai people. And there is nothing to say that it is not impossible; a recent Economist article revealed shifting loyalties in Isaan, once a Thaksinite heartland. But although not impossible, that does not mean there will be no difficulties; Thai history has proven that generals have never been very adept at running in elections, the prime minister is doing his popularity no favours by failing to combat corruption in his government. Of course, as Professor Thitinan also remarked on in his article, “no one should be under the illusion that democracy will automatically manifest itself” after the return to elections. Greater accountability, stronger institutions, better checks and balances, respect for parliamentary democracy: all of these are as necessary as elections. But these things cannot develop while Thailand remains under an unelected military government. Some are fearful: would Thailand not simply return to its pre-junta divisions? What if Thaksin’s party returns to power? I dislike the idea of a return to street fights, and I would not vote for any party aligned with Thaksin. But in the end, we must remember two things. First, the new constitution makes it more difficult for an outright Pheu Thai win. Secondly, we all need to grow up. Two coups had already been launched against Thaksin’s parties, and there is not much more than Prayut can do to de-root Thaksinite influence. In the end, if Pheu Thai really returns to power, then resistance needs to be led in a constitutional way. The Democrats need to learn how to either win elections or use parliamentary means to fight policies. For democracy to develop, Thailand needs to stop ripping apart its constitutions. ‘Diamond Heart’ may not be a song anywhere near as popular as Prayut’s first hit ‘Returning Happiness to the People’. But if he truly has a diamond heart, then he will take the most courageous path: to freely relinquish power and return democracy to the people.